Salisbury is the largest city on Maryland’s Easter Shore, and is the county seat of Wicomico County. It has an approximate population of about 30 thousand residents, but the number of people actually living in the city fluctuates depending on the time of year. The city is situated about 100 miles from Baltimore, and 120 miles from Washington D.C., and is a about a 2 hour drive from both cities. It is home to both the Wicomico district courthouse and the county circuit courthouse. The district court is located on Baptist Street downtown, and the circuit court is located on N. Division Street, also downtown. 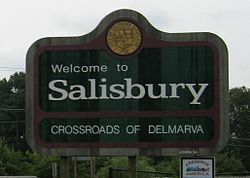 Although is one of the larger cities in the state, Salisbury does not have a particularly densely populated urban area. Crime levels in the Eastern Shore city are lower than in other Maryland cities such as Baltimore, and violent crime levels are much lower. There does tend to be a fairly significant number of drug possession and DUI arrests, which can partly be attributed to the thousands of college students that call the city their home during the school year. Salisbury University is one of the largest public universities in the state. With an undergraduate enrollment of approximately 9,000 students, the university makes up a large portion of the city’s residents. As is the case in many college towns across the country, university police and city police tend to arrest and cite a significant number of college students each year for drug and alcohol related offenses. One of the most common crimes in the area is DUI. Police make a large number of these arrests each year and many of these cases are first time, college age offenders. If you, or your son or daughter has been arrested for drunk driving it is always advisable to contact a lawyer with real experience defending criminal cases in the Wicomico county justice system. The lawyers at The Herbst Firm are available 24 hours a day, 7 days a week. An actual criminal defense lawyer will answer the phone and offer a free consultation about your case. A DUI charge may permanently appear on a person’s criminal background and driving record if the charges are not handled correctly by an experienced criminal lawyer. Just like any arrest such as a drug possession arrest it arrest may also affect a student’s standing at the university. There are also a large amount of drunk driving arrests on the eastern shore during the summer months when thousands of Marylanders make their way to Ocean City. These cases are handled differently in Wicomico County, and it is important to hire a criminal lawyer with Salisbury experience. If you have been arrested or given a citation contact the criminal lawyers at The Herbst Firm for a free consultation.